Smart Travel Asia, the online magazine advertising rates, Media Kit, and Reader Profile for over one million frequent travellers, from Dancing Wolf Media. 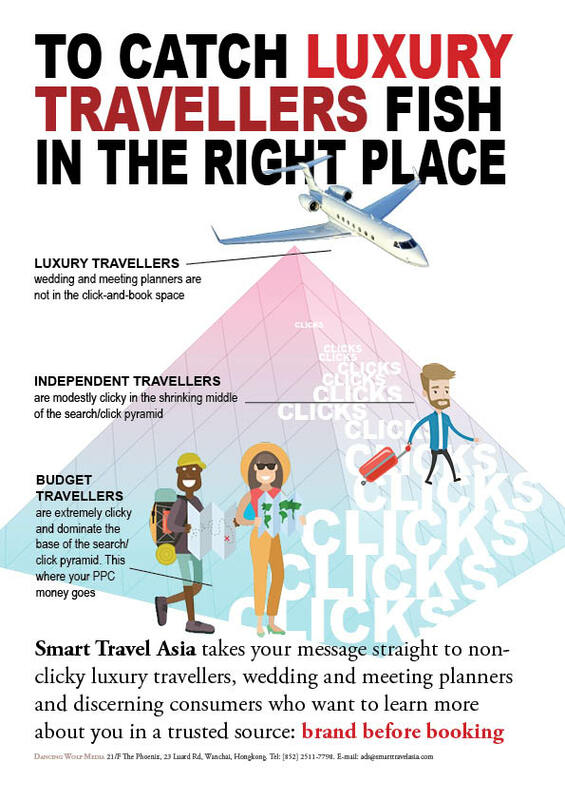 Launched in January 2003, premium online travel magazine Smart Travel Asia helps you reach a targeted luxury travel audience. Worldwide . Without Wastage. We help customers choose intelligently in the research space. Our global audience - Luxury Travellers, Wedding and Meeting Planners, Discerning Consumers, and Families - have one thing in common: frequent travel (14 air trips a year) and high income (US$178,000 per household). Our readers are drawn from banks and financial institutions, government, fashion houses, academia, tech companies, and multinational corporations. They spend more on travel and therefore take more time on research to seek quality information. Luxury Travellers need to connect with brand emotion, feelings, personality. Brand is an amotion. Luxury travellers are NOT IN THE CLICK-AND-BOOK SPACE. They fly high above the crowd and algorithms and formulas will not find them. The same is true for meeting and wedding planners. Luxury travellers and high-end corporates are not Alexa users - many would not be permitted to download third-party toolbars on office computers. Alexa is quite irrelevant for this audience as it appeals more to young I.T. professionals (or some marketing people) who toy around with it. If you have a Google toolbar, as most people do, there is no sensible reason to download an additional toolbar. No Alexa toolbar, no Alexa stats. It is statistical nonsense. But don't take our word for it. Check out other feedback on the Web on Alexa and social media numbers and some wilder rants. As SEO specialist Brian O'Connell puts it "The Alexa ranking has no basis to it. It is based on a sample of the internet users who have decided to install the Alexa toolbar/extension. This is a tiny self-selecting group which is focused in certain geographical and demographic niches. It has no statistic viability whatsoever." We have growing numbers of younger millennial readers too who, while less brand loyal, spend time researching new brands and independent players as they seek offbeat opportunities. ARE YOU JUST ANOTHER PRETTY FACE IN THE CROWD? Our readers are researching brands like yours and visit our site as a trusted source. We help build brand aspiration and interest. The research space always comes before retail and this is the space - where your potential customers get lost - that we are strongly positioned in. 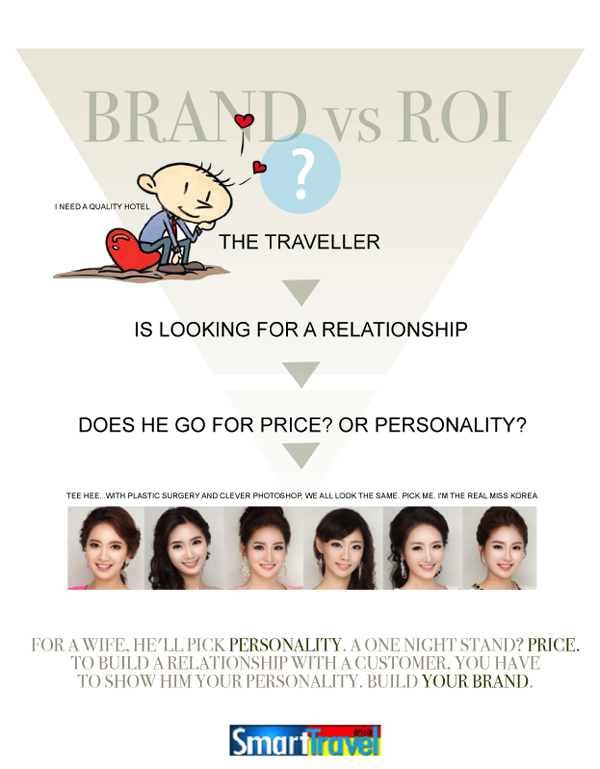 How do travellers choose online where everyone looks great (see graphic) and almost identical? This is a fundamental problem for all travellers. No brand, no booking. A worldwide circulation with 70% of readers based in Asia (key concentrations in China +Hong Kong (25%), Singapore (15%), India (8%), Japan, Korea, Taiwan, Malaysia, Thailand, Philippines); 15% in USA and North America, 15% in UK and Europe (with 8% in UK alone and key concentrations in Germany, France, Switzerland, Netherlands, Scandinavia, Portugal, Spain). As many as 10% of our readers are from Australia (included under Asia). South Africa, Russia and the Middle East + Iran and Turkey, are fast growing markets. As many as 96% of readers say Smart Travel Asia helps them make travel decisions after which 62% book through an online agent (OTA), 20% through an offline agent and 18% through a hotel website. High end and luxury product bookings do not commonly happen through a banner click as wealthy travellers tend to use their own trusted booking channels. We are about quality not quantity. Our focus is on building brand equity for our partner advertisers, not just generating clicks. Research shows that pursuing clicks can be a wasteful and costly exercise. Masses of fake clicks are generated by "Click Farms" that pay bored housewives and students to earn money by clicking on advertising banners and links. Kids are clicky, mature bankers are not. 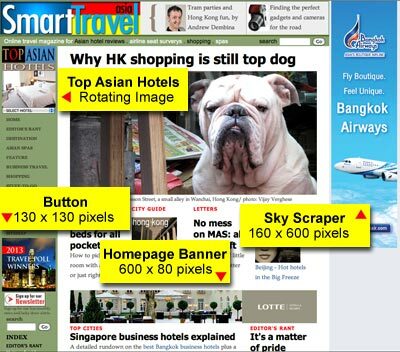 Smart Travel Asia and all individual articles on the site have high natural search engine rankings. We do not pay for links or visibility. And over 40% of our traffic is direct through bookmarks. And we get referrals from social media of various kinds. Print media reaches no one. Up to 95 percent of this circulation is idling in hotel rooms where copies simply do not get read. Check circulation audits at the Hong Kong Audit Bureau of Circulation, HKABC, to view some worrying distribution details. 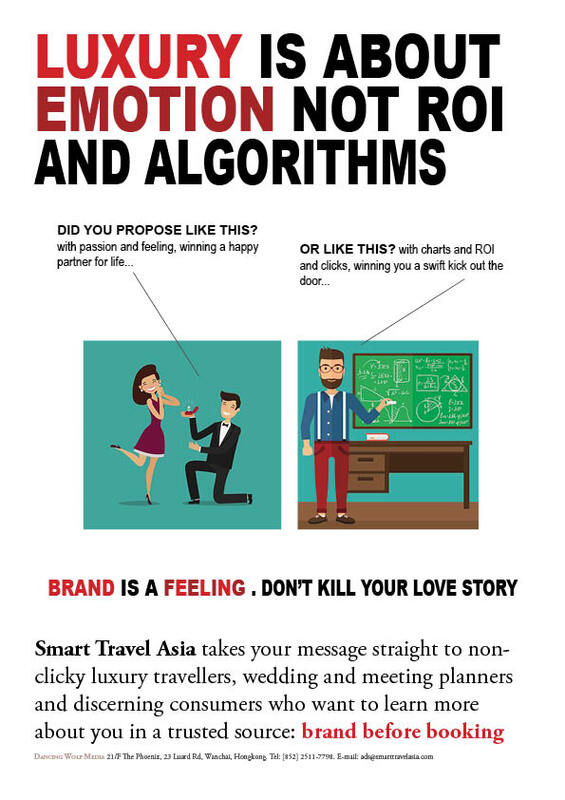 According to our annual surveys May-June each year, Smart Travel Asia readers get their primary brand information online (96%). They are looking for trusted editorial reviews and research. As many as 96% of readers say Smart Travel Asia helps them make travel choices after which 62% book through an online agent (OTA), 20% through an offline agent, and 18% through a hotel site. The share of OTAs has gone up over the past two years - as offline agents drop in popularity - but hotel bookings remain constant. Business Travel is, overall, one of the main factors influencing the huge total volume of travel. Shopping is a key pursuit for 58% of our high-spending audience (sharply impacting on visits to places like Hong Kong, Kuala Lumpur, Bangkok, Shanghai and Singapore). Top travel interest include Culture/History (70%), Spas (49%), Dining & Nightlife (48%), Child-friendly resorts (45%), Adventure/Nature (41%), Conference/Meetings (40%), Resort Weddings (35%), Golf (24%), Cruises (18%), Diving (18%), Casinos (15%). 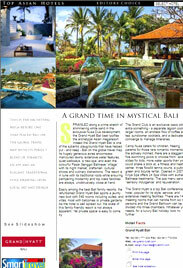 Smart Travel Asia readers are keenly interested in making quality high-end purchases. In percentage terms this purchase wish-list for the year includes Luxury Fashion (66% of readers), Duty-Free Alcohol (62%), Flat/Holiday Villas (43%), Mobile Phone (38%), Medical Tourism Packages (35%) Cars (30%), Laptops (12%), and Video/Cameras (11%). What are they reading and for how long? Reading times averages 3 minutes with visitors looking at an average 3 pages. The most time is spent on reccomendations and reviews. With our long years of print magazine design experience, we are specialists at creating A4 html pages that download quickly, are elegant and visually eye-catching, and have the ability to print out easily on A4 paper anywhere in the world. The A4 online pages are sold in combination with banners that click in to these pages and/or with editorial lead-in buttons in key spots. 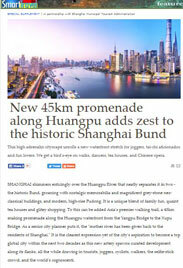 See an elegant two-page A4 format for Shanghai and an in-magazine big-visual running text Advertorial style with more text and bigger visuals in a smartphone friendly format. All our advertising is smartphone friendly. 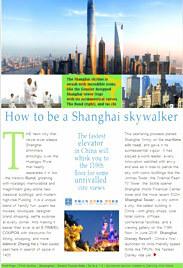 See a special in-magazine big-visual Macau Advertorial. If your business hotel, spa, or resort has a unique story to tell and is hand-picked by our editors - for service, style, beauty, location - you might receive an invitation to our Top Asian Hotels Collection. This unique branding platform features an exclusive collection of Asia's best hotel products. We strongly recommend these to our readers. The section is prominently displayed on every page with a one-click drop-down menu. Invited hotels get a rotating image that features on every page of our website along with a link on the dropdown menu. The pages print out in excellent quality on A4 paper. This section is the biggest single draw on our web magazine highlighting once again the huge reader demand for quality, and independent, hotel recommendation. Opt for prominently placed Display Boxes (Display Banners, rectangle, 300 x 250 pixels) or Skyscrapers (160 x 600 pixels vertical), for stylish, eye-catching animated messages. An ideal shape for fashion and luxury products. Any advertising product can be placed on any page on the site, subject to space availability. 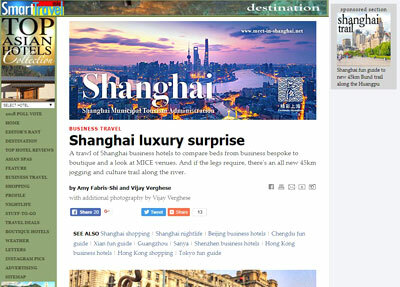 In addition to our Cinema Banners (600 x 160 pixels horizontal) is our new Cinema Banner XL (Extra Large) format at 600 x 240 pixels, which visually dominates the page top (see accompanying Shanghai Tourism banner page top accompanied by an editorial lead-in button for the advertorial). The Cinema Banner XL works brilliantly for destination marketing and product display. The format is large enough to carry strong visual information - or text - and its position at the top of the page, running the entire width, ensures the message gets seen. Use this for brand building or exciting images showing new rooms, a new hotel, a new property, a shopping mall, or a new car line. There may be a surcharge for high-traffic premium pages. Our new +explore... section is a great value, long term advertising option, perfect for a quick, entry-level, online launch. Build awareness of your brand fast and effectively. Buy a 200 x 100 pixel static image ad on a relevant page. Get a FREE image link to your site. Book at just US$1,000 NETT for the first month in 2019 and continue FREE till 31 December, 2019 at this one unbeatable price! * Book ad spots on multiple pages. The earlier you book, the more exposure you'll get. This section is smartphone optimised. *No placement on the home page. No statistics are available for the +explore section. One static image will remain in place for the duration of the campaign. No Flash advertising or GIF animation. Client to send us image Jpeg 200 x 100 pixels max file size 20kb and the desired link. Payment required prior to upload. Our rates are nett. Any ad product can be placed on any page on the site, subject to space availability. There may be a loading fee for high-value pages with superior traffic. ALL BANNERS ARE IN JPEG static image format for easy mobile phone viewing. Home Page Button: Left column, 130 x 130 pixels. US$3,000/ 30 days. Max file size 30kb. Inside Page Button: Left column, 130 x 130 pixels. US$2,000/ 30 days. Max file size 30kb. Home Page Banner: Home page Fixed Position, middle or bottom, 600 x 80 pixels, US$6,000/ 30 days. Max file size 40kb. 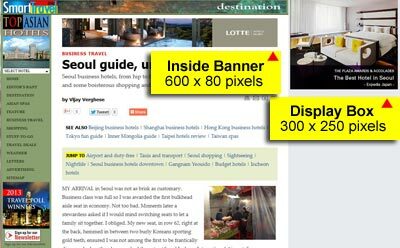 Inside Page Banner: PageTop, 600 x 80 pixels. US$4,000/ 30 days. Max file size 50kb. Second banner position US$2,000/ 30 days. Display Box/ Display Banner: Home page, US$7,000/ 30 days. Inside Page, 300 x 250 pixels, US$6,000. Max file 60kb. Skyscraper/ Vertical Banner: Home page 160 x 600 pixels. US$8,000/ 30 days. Max file size 60kb. Inside Page US$7,000. Cinema Banner: Max file size 80kb, US$8,000 horizontal, 600x160 pixels, 30 days. A Cinema Banner XL (Extra Large) format is available at 600x240 pixels. This visually dominant product with a page-top placement is priced at US$9,000 for 30 days, We can provide an excellent package for this eye-catching product. Advertorial: An A4 online format, single page, US$12,000/ 30 days. We do design and writing. No Flash objects and video on these pages to enable a smart-phone friendly format. A longer, more visually dominant in-magazine format is available calculated on the same basis in A4-page equivalents. This is a longer vertical format with larger font and an easy-to-read format with actionable links. Creative Services: We can create quality web collateral for you in various formats. Call us to discuss. PAYMENT DETAILS: Payment is expected in full within 15 days of uploading to our “live” sites of any particular product/ advertorial/ banner or button advertising. Bank Drafts or Telegraphic Transfers must be made payable to “DANCING WOLF MEDIA” at The Hongkong & Shanghai Banking Corporation Ltd, Hay Wah Building Branch, 71 Hennessy Rd, Wanchai, Hongkong, Account: 004-110-517331-001. Normal banner and button bookings/ cancellations 15 days prior to upload date. Special advertorial/ advertising bookings/ cancellations 30 days prior to upload or as specified in contract. All rates quoted here in Net US$.